Adobe Illustrator gives a lot of possibilities not only for editing but for drawing from scratch. Today you will learn to draw in Illustrator big and beautiful heart that you can use for collages, photo montage, gift cards, and holiday greetings to your family and friends. In Illustrator create a new document of size 800 × 600 with a white fill and a color scheme RGB. Take the tool Elliptical Tool on the toolbar and draw a simple circle with no fill. To turned round, not oval, hold the Shift key while dragging a shape. Now your task is to turn the circle into a heart shape. To do this, select the Convert Point Tool, which allows you to edit vector images as well as the Direct Selection Tool. Transform of the line shape change vectors so as to narrow the bottom part of the circle and make a sharp notch in the upper part – in short, to make the shape of a heart. Click along the outline of the heart right-click and click Make Selection, putting the blur radius is zero. Select the fill tool and fill the selected area with red color. Then copy and cut the selection to a new layer (Ctrl+Shift+J). After this surgery you have in the list of layers will appear three coats – you need to work on. Open control panel, colors and styles (Colors, Swatches, Styles). Using one of the styles you will give to your heart volume. Locate styles of Blue Glass (Button) – this style you will need. 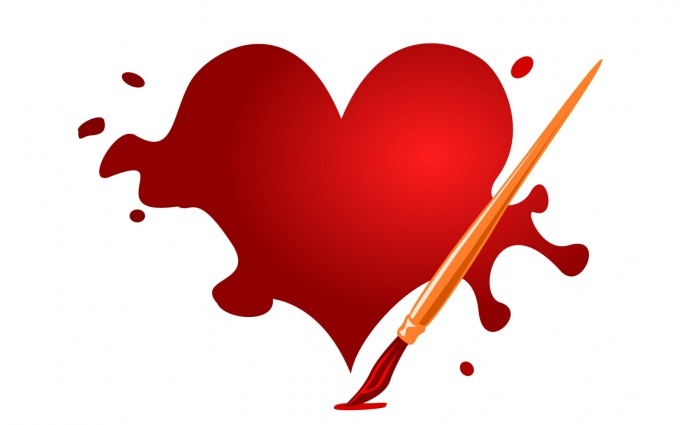 Heart gets larger, it will appear the natural reflections and shadows, but now need to perform the following operation on the drawing after applying a new style, you specify the red color could be changed. Correct the distortion of colors. Go to effects – the right of the name of your layer, double-click the icon with the letter f. Open Color Overlay and select the appropriate shade of red color that you originally wanted. Tab Inner Glow and reduce the opacity to 30% and then move the sliders in the Shading tab, Bevel and Emboss, while the level of volume and the appearance of the heart is not will suit you completely. Experiment with different styles, applying them to a painted heart and you will get many different original images for postcards and greetings. Now you will learn how to draw a heart. Step 1. Draw two circles next. Step 2. Draw an inverted triangle across the centers of the circles. Step 3. Draw two curves at the sides of the triangle. Step 4. Encircle your heart. Step 5. Add a couple of things from your heart. Erase all the extra lines. Now try to draw a heart with wings. To do this, create a new image 1000×800px with white background. Create a new transparent layer and draw the outline half of the heart to Reduce the selection and delete the excess. Remove the selection, set to overlay mode, Gaussian blur by 10 pixels and get a highlight on the heart on the left: to draw a heart with wings need the wings.